Pug design handbags and purses in a variety of styles. Featuring an adorable Pug portrait on the front and multiple zippered compartments for all your essentials, this fashionable tribute is a must for anyone who's ever loved a Pug!Finely handcrafted in supple black faux leather, this versatile crossbody purse features an outside flap pocket with a brown paw print accent, a snap closure and inner compartments for photo ID, credit cards and other on-hand essentials. Plus, this pocket's zippered outer compartment features a metallic heart-shaped zipper pull charm engraved with "I Love My Pug" for a sweet touch. This stylish satchel-style handbag is expertly crafted of luxurious cotton blend tapestry fabric that showcases heartwarming portraits of your favorite breed. Real leather double handles and faux leather trim add elegance, and a detachable adjustable shoulder strap transforms your purse into a shoulder bag in an instant. The interior is fully lined and features multiple pockets. Protective metal feet and antique brass-finished hardware add durability and style. This design available on your choice of several pouch styles, including makeup/cosmetics bag, coin purse, mini clutch, and wristlet. Funny picture of a gangster pug puffing on a stogie. This design available on your choice of several pouch styles, including makeup/cosmetics bag, coin purse, mini clutch, and wristlet. Black and white photograph of a very adorable little pug with soulful brown eyes. This design available on your choice of several pouch styles, including makeup/cosmetics bag, coin purse, mini clutch, and wristlet. 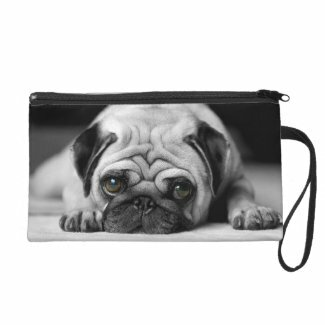 MORE Pug Shoulder Bags at Cafe Press and Pug Clutch Purses at Zazzle.